Over the past eleven weeks we have contemplated the life of Jesus. He has shown himself to us in the context of our examining his mission and our own way of life. We have considered two ways of desiring in Week 17 and three kinds of responses in Week 18. In contemplating his calling his disciples, in Week 21, we considered three degrees of being with Jesus. We now begin to contemplate how all this is played out in Jesus’ life. We begin to feel the tension developing as Jesus speaks more and more prophetically. As we read the readings, we grow in awe at his freedom and clarity. He sees through hypocrisy and names it. The fear of reprisal doesn’t in any way deter him from denouncing injustice. Jesus knows what happens to prophets. His words come out of the purest of poverty and indifference. He can surrender to humiliation and rejection and death itself, for he has become a humble servant of his mission. This week we want to enter into the tension and the freedom. We want to keep asking to be drawn to him as we let him show us this prophetic part of his spirit. He is the teacher, the healer, and the one who calls for justice, even at the cost of his own life. In all the background moments of our week, we can be imagining the words of Jesus that would confront hypocrisy. We can feel the tension and the freedom of his spirit there. We can let it address our hearts. We can speak with Jesus about our love and admiration for him, and our desire to be placed with him in a life that does justice. The helps to get started, “For the Journey,” and prayers will be especially helpful this week. The photo can inspire us this week and become a symbol of our desire to be free for mission. The late Fr. 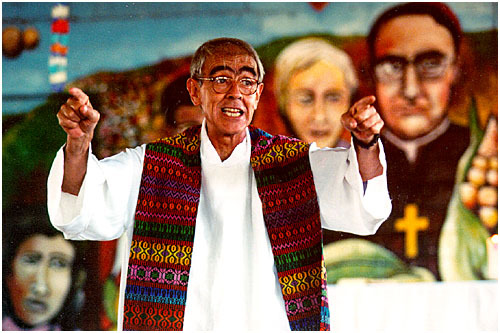 John Cortina, SJ, one of the inspiring Jesuits in El Salvador, preaching in front of a mural with an image of Archbishop Óscar Romero, can remind us all week of how the following of Jesus continues to show forth in heroism and martyrdom, in the name of justice, even in our day.